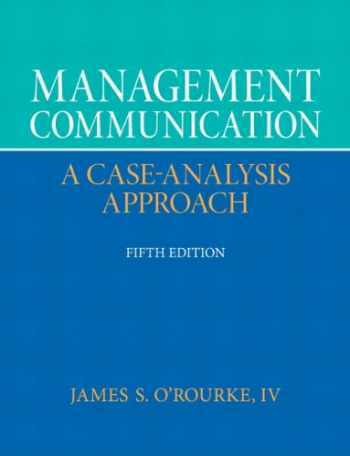 Acknowledged author James S. ORourke wrote Management Communication (5th Edition) comprising 432 pages back in 2012. Textbook and etextbook are published under ISBN 0132671409 and 9780132671408. Since then Management Communication (5th Edition) textbook received total rating of 3.5 stars and was available to sell back to BooksRun online for the top buyback price of $36.12 or rent at the marketplace. Strategic communication methods that support the development of ethical and effective managers at all levels of business. For readers who know that they need effective communication skills in order to be successful in the business world, this text provides a strategic, yet practical view of managerial communication.